The third item on my 12 Days of Christmas wishlist is the Michael Kors Chronographed Rose Gold Watch. 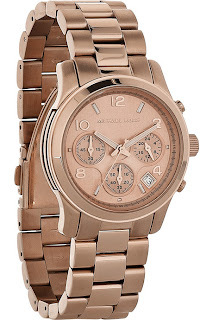 This watch has been on my "summer must-haves" and "fall must-haves " list and is still on my Christmas wishlist because I still don't have it in my possession..lol What more can I say about it, other than it being a beautiful time piece that every girl should own. Hopefully Its under the tree this year and I don't have to bore you guys about it anymore. I am going to treat myself to a gold one, one of these days!! !